The DHC-6 Twin Otter, registered PK-BRM was being operated by Aviastar Mandiri as a scheduled passenger flight with flight number MV7503. The aircraft departed from Masamba/Andi Jemma Airport intended destination to Makassar-Sultan Hasanuddin International Airport on the island of South Sulawesi in Indonesia. 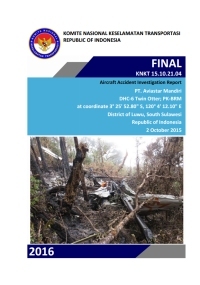 At 06:36 UTC, the pilot informed the Ujung Pandang Information officer that the aircraft had reached 8,000 feet. One minute later the pilots discussed to fly direct to Barru from their current position. Barru is a town located at about 45 Nm north of Makassar. Both pilots agreed to fly direct and the second-in-command (SIC) explained the experience of flying direct on the flight before. A few seconds later the SIC suggested to delay the direct flight for a while. At 06:50 UTC, the PIC told the SIC that he wanted to climb and the CVR stopped recording. The aircraft impacted treetops and crashed on the top of a mountain at an elevation of 7734 feet. The wreckage was located on Bajaja Mount on October 5. Contributing Factors: "Deviation from the company visual route without properly considering the elevated risks of cruising altitude lower than the highest terrain and instrument meteorological condition in addition with the absence of the EGPWS warning resulted in the omission of avoidance actions." To evaluate the effectiveness of the CRM training and ensuring the correct pilot implementation. To ensure all pilots are appropriately trained on the operation and testing of the EGPWS/TAWS systems. To ensure EGPWS/TAWS operational test procedure is incorporated into the Operator’s Standard Operating Procedures (SOP) and pre-flight checklists. To emphasize the continuity of oversight program to ensure the installed EGPWS/TAWS functioning properly. Distance from Masamba/Andi Jemma Airport to Makassar-Sultan Hasanuddin International Airport as the crow flies is 290 km (181 miles).